In preparation for the second meeting of the Open-Ended Committee of Permanent Representatives (OECPR-2), Major Groups and Stakeholders (MGS) met on Sunday, 14 February 2016, at the United Nations Office at Nairobi (UNON), Kenya. 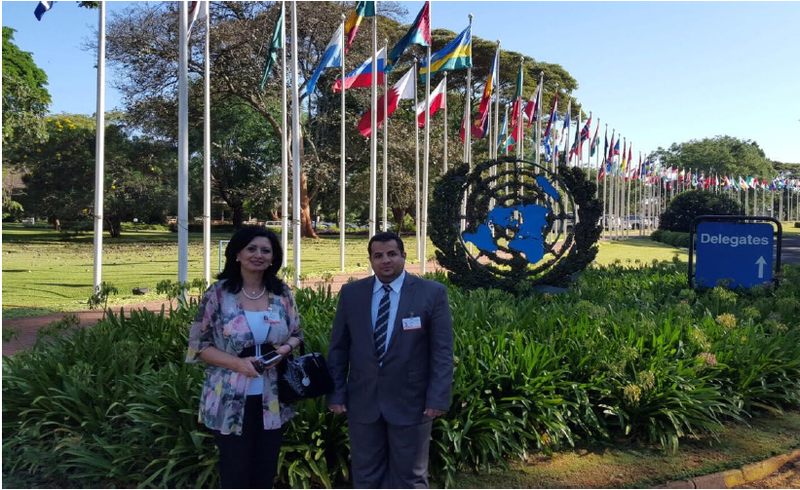 They discussed, inter alia: the need for input from UNEA-2 to the Third UN Conference on Housing and Sustainable Urban Development (Habitat III); the environmental impact of the refugee crisis; and the role of the MGS in the OECPR and UNEA processes. The MGS also engaged in joint and working group talks on the OECPR agenda, with a view to presenting concrete messages to Member States on the draft resolutions to be negotiated and forwarded to UNEA-2. They considered topics including: the 2030 Sustainable Development Agenda; the Paris Climate Agreement; mobilizing finances for investment in sustainable development; the Global Thematic Report on the theme of “Healthy Environment – Healthy People”; and the sixth Global Environmental Outlook (GEO-6) process. Julia Pataki, CPR Chair, expressed appreciation for the contribution of MGS to CPR meetings, assuring them that the CPR “is determined to continue on a path of openness and transparency.” Ibrahim Thiaw, UNEP Deputy Executive Director, noted that as implementation of the Sustainable Development Goals (SDGs) begins, the world’s attention has been taken up by humanitarian crises. He drew attention to the need for tackling the root causes of displacement and conflict, and urged MGS to highlight critical challenges such as integrating the climate and biodiversity agendas, “decarbonizing and detoxifying” economic growth, and moving beyond “private sector philanthropy” towards new sustainable business models. MGS held an interactive dialogue with representatives of Member States and Jorge Laguna Celis, UNEP Secretariat of Governing Bodies. They discussed issues including improving opportunities for stakeholder engagement through creative and less costly means of interaction, and implementing a genuinely inclusive green economy agenda. Member States endorsed the role of stakeholders in the preparations toward UNEA-2. – Healthy Environment, Healthy People Even though MG&Ss and RRs were able to find consensus on concrete recommendations that follow, there could be different views being expressed on some recommendations during the OECPR. ensure coherence and the integration of the environmental dimension of the 2030 SD Agenda. UNEA should deliver clear political input on how to ensure that the environmental dimension of SDGs is achieved and urge member states to seek coherence within the different ongoing intergovernmental processes and UN bodies (ECOSOC, HLPF, UNGA, UNFCCC, FfD, etc.). Member states and UNEP should propose concrete actions to achieve the outcomes on the Environmental Dimensions of SDGs relying on its technical expertise. MG&Ss and RRs to ensure broader, inclusive and regional representation throughout all intergovernmental processes so that their voices on environmental issues are heard. For that sufficient resources need to be granted. The CPR Chair provided a Food for Thought Paper for UNEA-2 last year. It suggested a ministerial level informal dialogue under the call for “Mobilizing resources for sustainable investments”. This would present best practices and innovations identified in various countries that demonstrate the potential for public and private sector resource mobilization for sustainable development realizing that there are different approaches, visions, models and tools available for each country, in accordance with its national circumstances and priorities, to achieve sustainable development In its three dimensions. We support this proposal and ask member states and UNEP to involve stakeholders in the design of the discussion and as speakers. Sustainability and accountability criteria should be met, building on the UN Guiding Principles for Business and Human Rights as well as others. – Prioritize redirecting financial institutions and other investor decisions towards reflecting longer term investment-risks for sustainable development through policies and incentives. – Pursue economy-wide coherence on taxation and subsidies, take action on tax evasion and avoidance, and implement measures to eliminate harmful tax competition. UNEP should take stock of and track finance and investment towards environmental aspects of SDGs as part of its work-stream on Environmental Aspects of SDGs. UNEP consultation with FfD involving major groups and stakeholders increase and implement environmental aspects of the Addis Ababa Action Agenda. UNEA should urgently agree on the Stakeholder Engagement Policy and therefore we welcome the efforts taken by the President and the Bureau of the UNEA. UNEA should embrace the principle of no regression, especially regarding the accreditation process. UNEA to acknowledge that there is already a mutual trustful stewardship of the MGFC to ensure respectful and meaningful participation of the MG&Ss and RRs. b) On Access to Information Policy, MG&Ss and RRs welcome the current text and appreciates the participatory process. 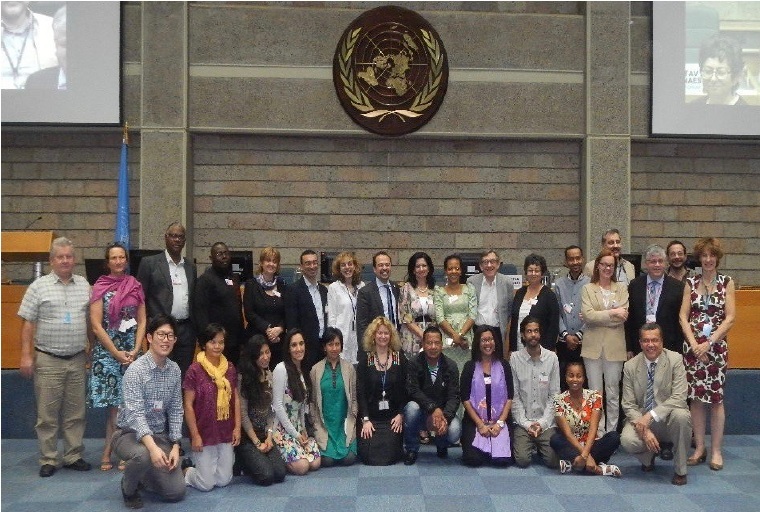 MG&Ss and RRs welcome the proposal and acknowledge that this opportunity was missed at UNEA-1. UNEA should not focus only on inviting business leaders but invite proven leaders on sustainable development issues at all levels and from all constituencies and encourage this to be a regular practice in future UNEAs. -Including a specific MG&Ss and RRs follow-up meeting during non-UNEA years. – Better use of modern communication technologies. MG&Ss and RRs also invited UNEA to have a special session on HABITAT-III at UNEA-2 as an input from Environment Ministers and global environment community to the upcoming New Urban Agenda. Considering the important outcome of COP21, MG&Ss and RRs discussed the role UNEA can play in the implementation of the Paris Agreement. UNEA should stress phasing out fossil fuels and coal and make strong commitment and investment to renewable energies. It also should clearly define what “renewable energies” are. UNEA should integrate and implement the Lima Work Programme on Gender regarding its Climate change policies. Initiatives primarily coming from domestic (national, sub national and local) resources and further facilitated by external sources. – From design, implementation, monitoring, reporting to evaluation – in adaptation programs. MG&Ss and RRs acknowledge that unsustainable consumption and production patterns are Major causes of negative impact on environment and health. When confronting the actual economic system and going beyond GDP growth as main indicator, achieving healthy environment and healthy people is feasible. – Respect the human rights for a healthy environment and make public and private sector accountable for environmental damage they cause. Governments have the obligations to enable a healthy environment for all, and need to take their responsibility here. – Improve education, awareness and transfer of clean and affordable technology. – Transition towards sustainable consumption and production patterns to minimize pollution and decrease the inequality gap. UNEP Executive Director Achim Steiner, around 25 Member States and regional groups made statements. Addressing the meeting in a video message, UN General Assembly President Mogens Lykketoft described UNEA-2 as a key intergovernmental checkpoint on the road to 2030, and highlighted its role in integrating the environmental dimension across all the Sustainable Development Goals (SDGs). UNEP Executive Director Achim Steiner noted Member States’ support for UNEP’s role in the global sustainable development architecture, and emphasized that the organization has demonstrated efficiency and effectiveness. Delegates adopted the agenda and organization of work, and appointed chairs for the week’s discussion on the five “clusters” of draft resolution text. UNEP support for air quality issues in the Asia-Pacific region; the need for a long-term plan for UNEP-Live as a tool for policy makers; and ways to meet the cost of implementing the environmental dimension of the 2030 Agenda for Sustainable Development. They also discussed: the programme performance review; the Medium-Term Strategy, Programme of Work and budget; and changes to the UNEA cycle. A reception took place in the evening, hosted by the Netherlands and Romania. Delegates at OECPR-2 began negotiating draft resolution text on Tuesday, meeting in five separate clusters to consider their respective sections of a compilation text dated 15 February 2016, which contained a total of 24 resolutions. Clusters 1 and 2 met in parallel during the morning, and Clusters 3 and 4 met in parallel during the afternoon. Discussions in Cluster 4, on the sustainable management of natural capital extended into the evening, as Cluster 5 also convened in the evening. Delegates discussed proposals on issues including, inter alia: education for sustainable development; the role of the UN Environment Programme (UNEP) in delivering on the environmental dimension of the 2030 Agenda for Sustainable Development; Environmentally Sound Technologies (EST) on waste management; a strategy for the sound management of chemicals and waste globally; oceans and seas; the sustainable management of natural capital; illegal wildlife trade; integration of biodiversity for wellbeing; and synergies among biodiversity-related MEAs. Sustainable Development Goals (SDG) delivery, and stressed UNEA’s key role in facilitating synergies across the UN system. A panel of ministers and senior officials from Ethiopia, Kenya, the Solomon Islands, and the Netherlands discussed the issues, followed by open debate among delegates. In the afternoon, negotiations on draft resolution text continued in Clusters 1 and 4, which addressed, inter alia: implementation of the Small Island Developing States (SIDS) Accelerated Modalities of Action, or SAMOA Pathway; role, functions and follow-up to the Forum of Ministers and Environment Authorities of Asia Pacific; and three resolutions on the impacts of armed conflict on the environment. A reception took place in the evening, in the residence of US Permanent Mission to UN Ambassador Tobias Glucksman. Assembly of the UN Environment Programme (UNEA-2) in the morning, while Cluster 2 discussed a resolution on sustainable consumption and production (SCP). Sustainable Development, while Cluster 4 conducted a second reading of resolutions dealing with natural capital and conflict-affected areas. Negotiations continued late into the night. A side event on “Guidelines for Integrated Waste Management Framework Legislation” took place at lunchtime, convened by UNEP. On the last day of the second Open-Ended Committee of Permanent Representatives (OECPR-2) meeting at UN Environment Programme (UNEP) headquarters in Nairobi, delegates met in parallel sessions to discuss resolution text. Clusters 1 and 2 met all morning, with Cluster 1 continuing through lunchtime. Cluster 1 addressed proposals on the organization of regional forums, implementing the Paris Climate Agreement, and the role of UNEP in the implementation of the SAMOA Pathway to facilitate achievement of the Sustainable Development Goals (SDGs), while Cluster 2 discussed sustainable consumption and production (SCP) and food waste. During lunchtime, Cluster 3 conducted the first reading of a resolution for sustainable management of coral reefs. Delegates convened in plenary in the afternoon, where UN Environment Assembly (UNEA) President Oyun Saanjasuren briefed delegates on arrangements to finalize the agenda for ministers when they meet at UNEA-2 in May. UNEP Executive Director Achim Steiner briefed delegates on preparations for UNEA-2, highlighting the organization of 26 side events and two symposia. In their closing statements, regional groups and Member States expressed appreciation for the constructive discussions. 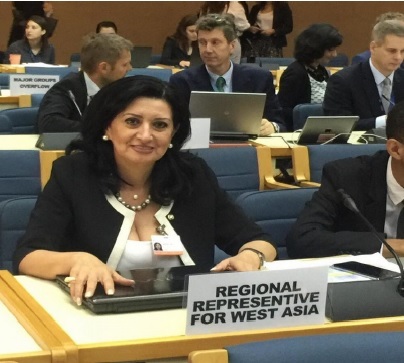 I am Marie Therese Seif, one of the regional representatives for West Asia. This statement is supported by Major Group “Science and Technology”, Major Group” Women” and the Regional Representative for EECCA countries. Some countries in West Asia are experiencing a range of insecurity conditions from a state of war, occupation, and the over exploitation of natural resources. These have negative effects on the Economic, Environmental and Social dimensions of sustainable development, especially for local communities. The impacts of climate change create new challenges for Stability, Safety and only Increase Security Risks for the region. The Middle East and North Africa are most vulnerable to the effects of climate change. For example, expectations are that demand for water in the Middle East will increase five-fold by 2050 and exceed supply by 50%. This will lead to further tensions, Instability and Violence in water-scarce countries, particularly those suffering from mismanagement. We are deeply concerned about the mounting stress on Natural resources in countries hosting increasing numbers of refugees in the West Asia Region, which hinder efforts to achieve sustainable development. We take note of the 2009 Report of the United Nations Environment Program entitled “Protecting the environment during armed conflicts.” We wonder how this is going to be implemented in our region, especially the necessary technical and financial support required for the protection, rehabilitation and safeguarding of Environmental Resources in hot spot areas. We urge all developed countries to allocate adequate technical and financial assistance in addition to the Official Development Assistance (ODA). We also urge the establishment of a special fast track financing mechanism easily accessible to countries, especially developing countries that are affected by the migration of regional refugees. We ask member states to develop an Inventory and Analysis of relevant International laws, which identify the current gaps and weaknesses in legislation intended to protect of the environment, during armed conflicts and develop recommendations on ways to strengthen the legal framework and means of its enforcement.